Review of Russia Without Putin: Money, Power and the Myths of the New Cold War (Verso, 2018). Is there a single figure who looms as large in the elite Western psyche as Putin does? Only Trump can claim to rival the wild obsession the Russian president inspires among Western media and policymakers. And even he lacks the sheer staying power of Putin, who at this point has been doing the work of panicking the Western world’s best and brightest for at least a decade of his rule. Putin holds a special place in the Western imagination. Part evil archnemesis, part malevolent chessmaster, the Russian hacking of Democratic Party officialdom during the 2016 election transformed Putin from just another exotic villain-of-the-week to the Ernst Stavro Blofeld of the global political order. As the story goes, a newly ascendent Russia, led by Putin and with an eye on returning to its Soviet-era glory, has taken advantage of the West’s weakness and hesitation to ruthlessly expand its power and challenge, in particular, US dominance of the post-Cold War order. In this environment, Russia — and by extension, Putin — is everywhere. He “hacked” the 2016 election and installed a president who does his bidding. He brought about Brexit and the rise of the far right throughout Europe. His sinister hand was behind the rise of anti-fracking, anti-banking, and antiwar sentiment in the US. He’s secretly orchestrated everything from Black Lives Matter protests to the recent yellow vest revolts. When people started mocking conservative commentator Max Boot for a year-old tweet that the US needs its own version of Emmanuel Macron “who can make centrism cool,” it was because Putin wanted it so. Putin is Russia, and Russia is the cause of all the Western world’s current ills. In Russia Without Putin: Money, Power and the Myths of the New Cold War, Tony Wood dares to violate many of these stock conventions by asking not just what Russia would look like if we looked beyond its figurehead, but if we saw Russia as it really was: an intermediate world power held together by an unsustainable economic and political model, and with several potential crises looming on the horizon. Rather than the product of one man’s evil, Wood argues that Russia’s policies are better explained by the last thirty years of Western foreign policy, the particular economic and political makeup of post-Soviet Russia, and the pressures facing its ruling class. Wood’s narrative pokes a finger in the eye of most pat thinking on the subject by trying not to center Putin in its analysis. Putin of course still dominates the book, though not in the same cartoon supervillain style that predominates in most political writing today. But Wood is at pains to stress that he is simply one part of a larger system of oligarchic authoritarianism inherited not from Communism but the Boris Yeltsin years, when the ex-Soviet Union was buried under a mass of radical neoliberal reforms that spread grinding misery throughout the country and left it a shriveled husk of what it had been before 1991. Wood’s Russia isn’t a reascendant superpower on the march. It’s a relatively weak, isolated nation teetering on the brink of instability and held together by a nationalism that has become newly powerful this decade. Its GDP per capita is around a sixth of the US’s and a quarter of the OECD average, with sluggish growth forecast for the future. Its mortality rate has long outpaced its fertility rate, with its population forecast to plunge in the coming decades. And far from a military threat, its 2015 military budget wasn’t even a tenth of that of NATO’s, let alone that of the US, while more and more of its neighboring states join the Western military alliance and China grows in power on its southern border (though Russia does still possess a huge stockpile of nuclear weapons). Moreover, it’s a country that was virtually brought to its knees by a decade of Western meddling in its domestic politics. Wood throws out startling statistics from the nineties to remind us of the extent of Russian suffering during the Yeltsin years: Russia’s GDP shrinking more sharply than that of the US in the Depression; 60 million people living on less than $4 a day; male life expectancy dropping five years in the space of only three. Such numbers were the direct outcome of policies imposed by not just a government the US steadfastly backed and worked to reelect, but by US-led organizations like the IMF. But it’s Wood’s reevaluation of the past three decades of US-Russia relations that may be the most interesting to readers, particularly those who have come to the “New Cold War” with only the knowledge of Russia’s 2016 US electoral misadventures and its earlier interventions in former satellite states like Ukraine. Wood sketches out the measures that have helped create a Russia increasingly antagonistic towards the West: the broken American promise not to expand NATO eastward; Bill Clinton’s intervention in Kosovo; George W. Bush’s reckless and bloody invasion of Iraq and his accompanying expansion of US power abroad; and that administration’s withdrawal from the Anti-Ballistic Missile Treaty in 2002. To that we might also add successive administrations’ refusals to sign onto Russia-backed agreements limiting the weaponization of space and cyberwarfare, the latter of which would come back to spectacularly bite the US in 2016. As he explains, the change in Russia’s attitude was a product of a “stark imbalance of power” between Russia and the West. Suddenly weak, Russia was simply forced to grin and bear the Western expansion of power following the fall of the Berlin Wall. This was paired with a consistent rejection of Russia’s entreaties to the West, from trying to set up an anti-terror alliance with the US (one that would no doubt have meant added misery for many of the world’s Muslims, but a genuine attempt at outreach nonetheless), to Putin’s repeated suggestions that the country join NATO and both his and former president Dmitri Medvedev’s push for economic integration with Europe. As late as 2013, Russia’s official “foreign policy concept” made “relations with the Euro-Atlantic states” a top priority, and even in 2015 Putin was still pushing for an anti-terror alliance. These disappointments have continued in the Trump era. Whatever transpired between Trump and Russia during the election, the Kremlin is clearly disappointed with the result. President Trump has been more aggressive towards Russia on the world stage than his recent predecessors, betraying the promise of a candidate Trump who appeared more favorable than most other US political figures toward rapprochement with the former great power. He has of course been abetted, if not pushed, by a US media that experienced a collective freakout over the mere mention of bilateral talks with the country, even as it lavishes praise on dead presidents for that very thing. All of these facts are inconvenient to the current, flattened narrative that prevails in most mainstream talk on the subject, which paints Russia as a singular, malevolent force in the world, more apt for a Disney villain than the world’s second-biggest nuclear power. This narrative pulls double duty: it drives the push for conflict with the country, long sought after by the Right, while erasing the role of Western policy in helping create the more nationalistic, interventionist Russia of today — Bush’s “they hate us for our freedoms” pablum, redux. What would US policy toward Russia look like if we rejected such bromides? For one, it wouldn’t treat routine matters of diplomacy as treason. 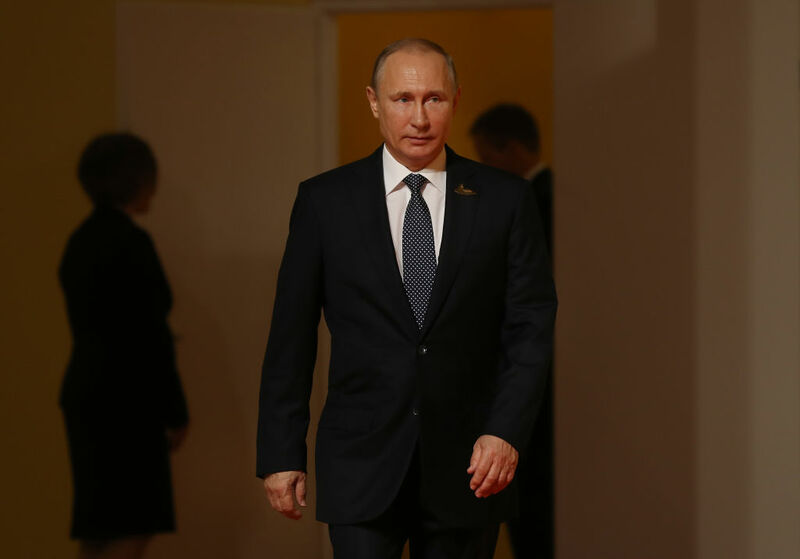 There are mutually beneficial matters that Russian leadership, and certainly Putin, are clearly eager to engage the US on, the most pressing among them arms control. The US should be working with the country to reduce their respective nuclear stockpiles, not as is the case right now, upgrading them and tearing up yet more Cold War-era treaties. A zero-sum vision of US-Russia relations strengthens the hand of pro-war voices, who paint any such negotiations as a cunning Putin plot to weaken the US. Such efforts would, ideally, extend to bilateral negotiations around other contentious, world-threatening issues, such as the weaponizations of space and cyberspace. Applying mutually agreed-upon limits and rules on behavior in these fields would not only limit the harm that can come from them, but build trust between the two nations. The Cold War, after all, was gradually ended through decades of careful, persistent diplomacy and negotiation, not through endless ratcheting up of threats and arms build-ups, a road that has only ever taken us close to hot wars — a truth of even Reagan’s legacy that his heirs choose to ignore. It might also involve not giving knee-jerk backing to illiberal, neo-Nazi-infused regimes like those of Ukraine simply because of their anti-Russianness. The US government has already tried this for many decades. It produced only misery for foreign populations, while planting the seeds of resentment that bloomed violently back home. Perhaps more importantly, it could mean the halting of NATO’s eastward membership drive, one of the causes of the ongoing Ukraine crisis and, given that Russia’s military spending is dwarfed by NATO alone, an entirely pointless provocation. At a time when tensions between Russia and the West are higher than they’ve been in decades, the world lacks many of the safeguards of the “old” Cold War: the institutional mechanisms of cooperation and negotiation, an antiwar bloc in politics and media prepared to push back on hawks attempting to ratchet up the possibility of war, and, as Wood points out, “a sizeable body of writers, scholars, activists, and thinkers” to paint a more nuanced image of the country to counter the mass of “ill-informed speculation” that prevails. Russia Without Putin is a crucial contribution to that project.